BibliOdyssey: All Hail Lord Carrington! 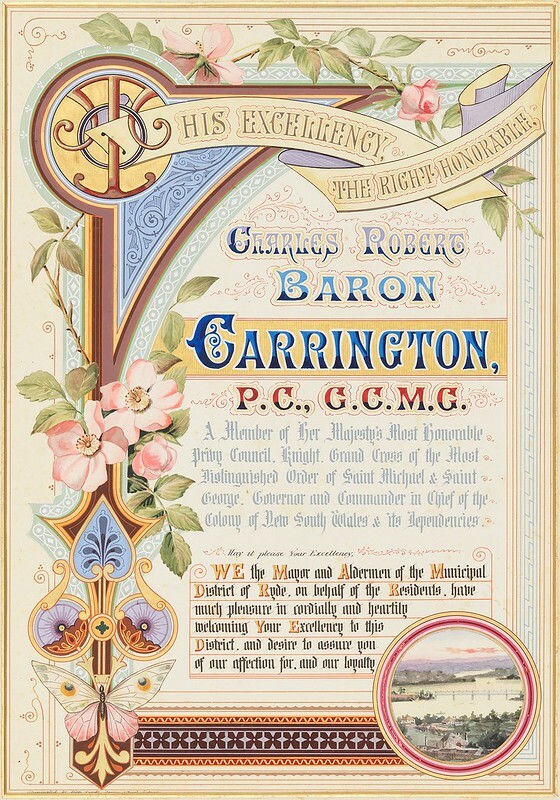 From 1885 to 1890 Lord Carrington was a popular Governor of NSW. 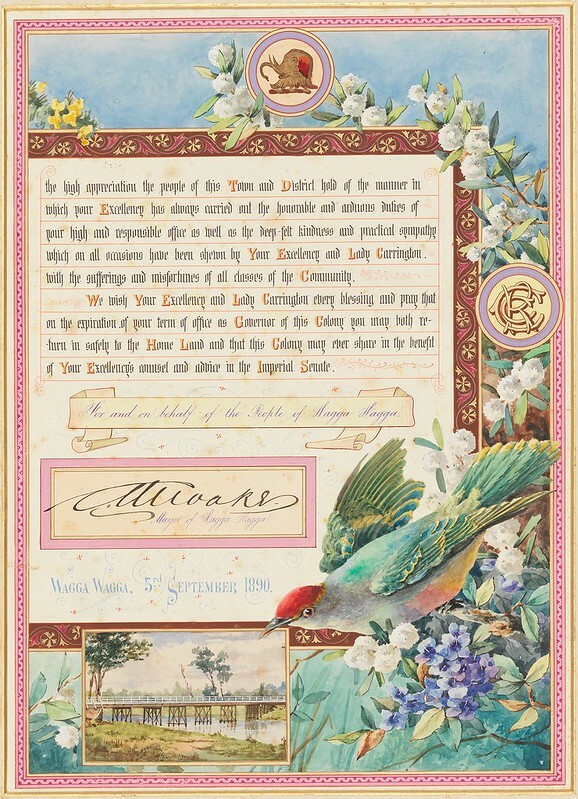 He and his wife were held in such high regard by the people of NSW that a grand series of presentation albums was created by various community associations and districts to honour their service and bid them farewell when they returned to England at the end of their tenure. 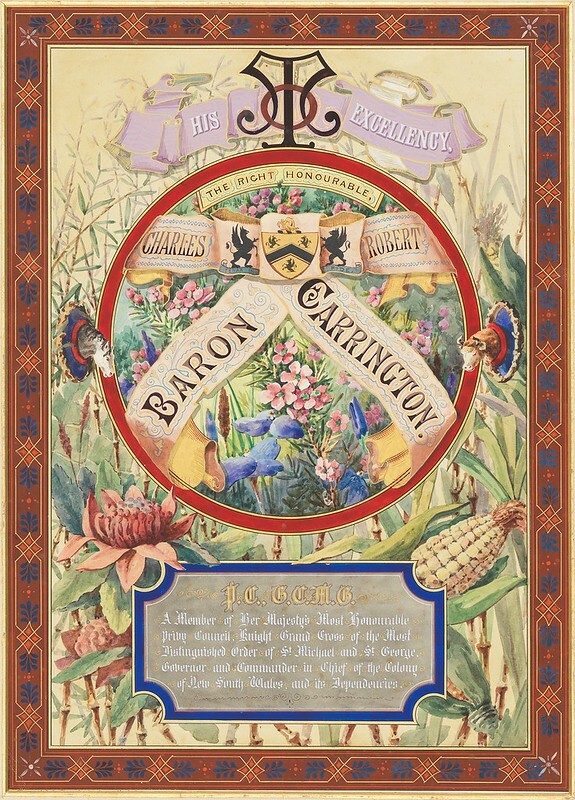 The Carrington Albums, as they have come to be known, were sent back to Australia in recent years by a Buckinghamshire (UK) library that housed the series on behalf of Lord Carrington's descendants. 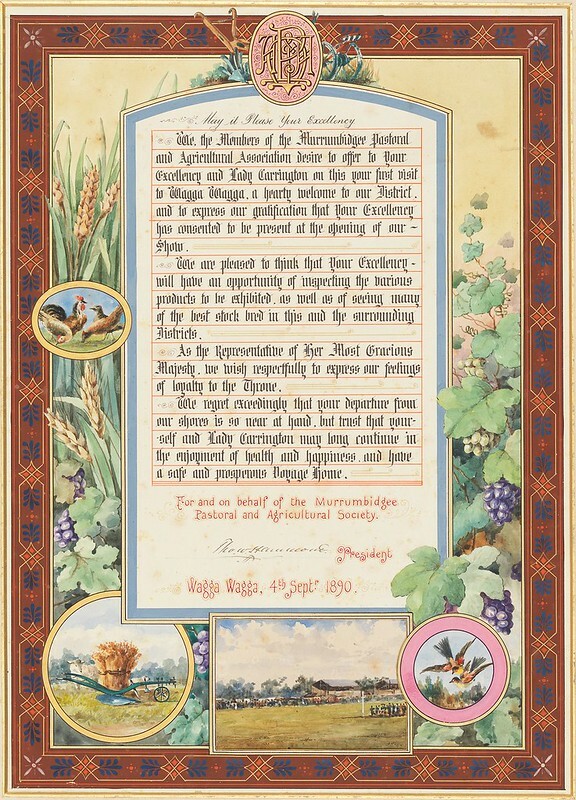 NSW State Records has digitised and placed online a number of the illuminated albums. The pages seen below come from volume 14 (they were the largest images from the available albums). 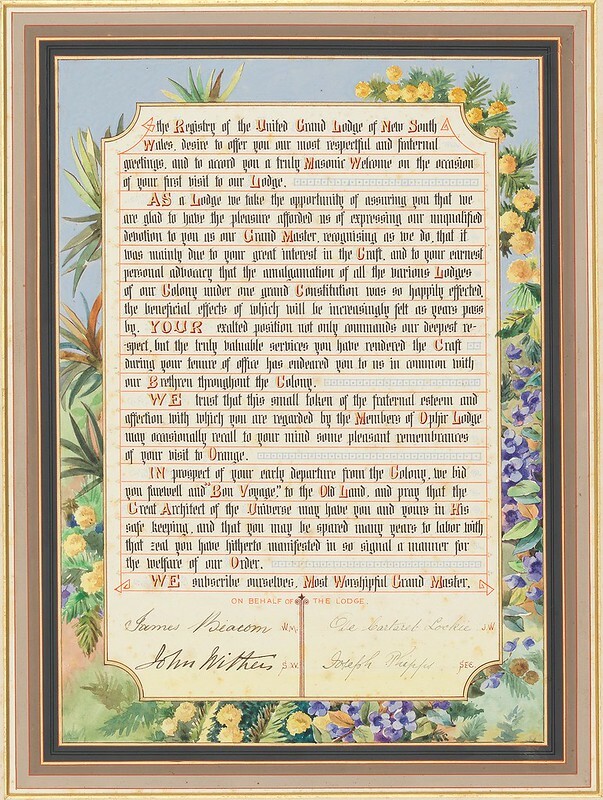 "This ‘most auspicious’ appointment [of Lord Carrington] attracted much ceremony in NSW and as a consequence saw the creation of highly decorative illuminated addresses and photograph albums to be officially presented to he Governor. 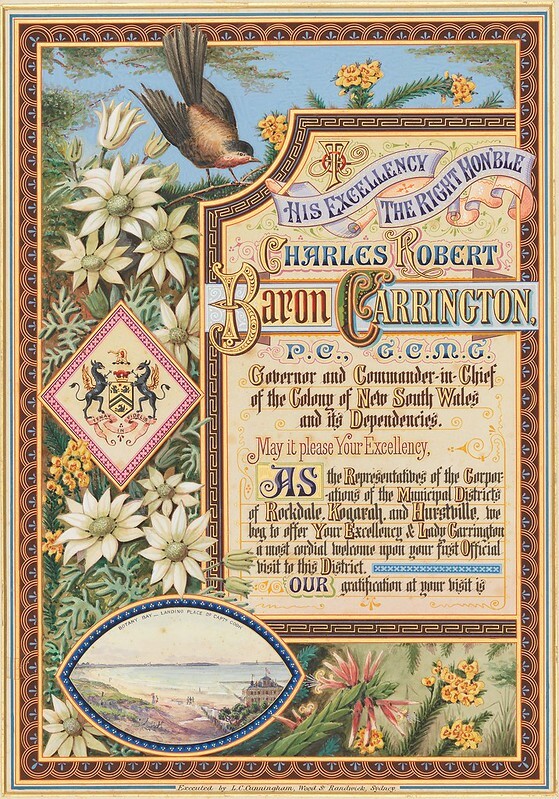 During his time as Governor of NSW it was said Lord Carrington, aided by his wife, re-established the opulence of Government House and the grandeur of the office of Governor. 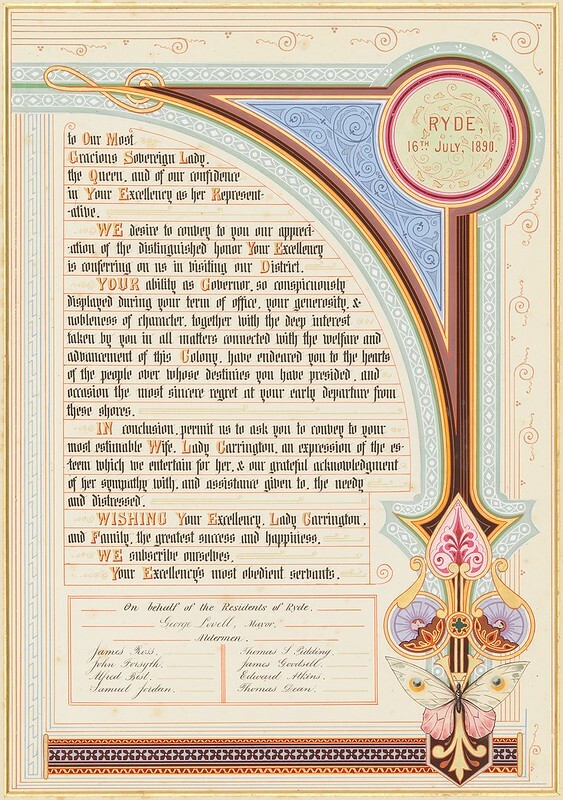 Upon conclusion of his time as Governor, Sydney gave Lord and Lady Carrington an unprecedented farewell, with thousands lining the streets and showering their carriage with flowers. 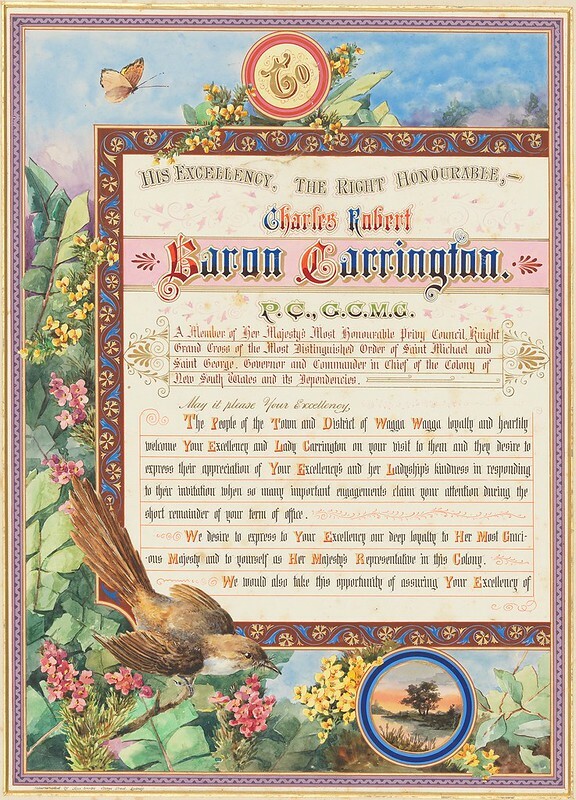 In a parting speech, Carrington declared they were 'guests who found their welcome at once an adoption, and whose farewell leaves half their hearts behind’." 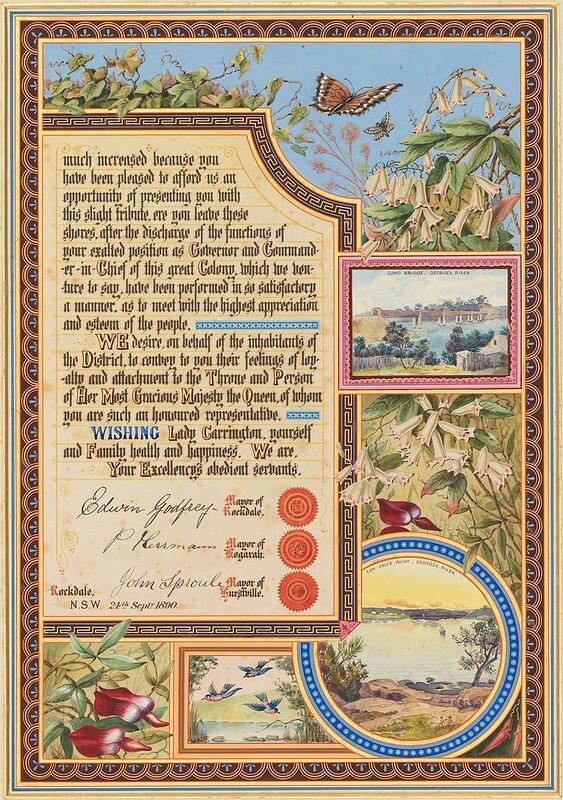 The illuminated addresses were produced by watercolour artists from at least one Sydney publishing firm, John Sands Ltd^. There is a definite attempt to decorate the locality-based addresses with flora associated with the particular district, but enough poetic license taken at times that we can conclude that natural history accuracy was not as important in the creative process as aesthetic qualities. Consequently, there are said to be some 'imaginary' plants visible among the known natives. 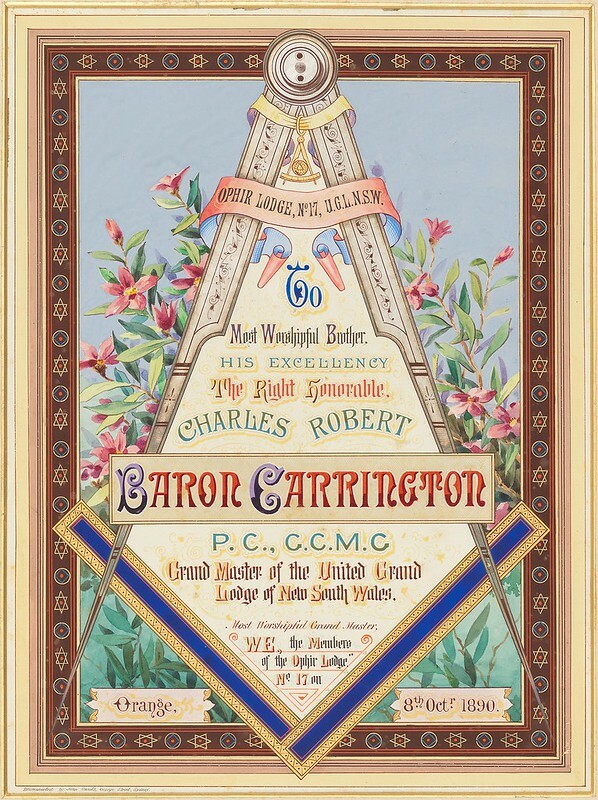 'Album[s] of Addresses presented to Lord Carrington as Governor of New South Wales 1885-1890' is partly-online and available from NSW Government State Records (where I presume they interchange 'volume' with 'album'). I recall there are four albums digitised in total - three from the first five listings, plus volume 14 on the 2nd page. 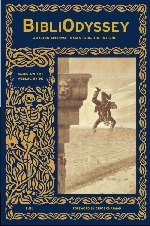 The images above are sourced from the last or 2nd last volume. The State Records - Digital Gallery entry provides background, including a number of interesting commentary and associated links. via: Cultural Collections, UON Library. The All Hail Lord Carrington! post first appeared on the BibliOdyssey website.